The following is a transcription of the G.S. Pelly Private Cemetery which is located on Otter Lake Road in Spallumcheen, British Columbia, Canada. Latitude: 50o 24' 14.57" N.
Longitude: 119o 15' 32.10" W.
Richard Stuart Pelly was the second son of Charles Henry and Julia Henrietta Pelly. Richard married Frances Anna Robinson, daughter of George Robinson, J.P. of Thomastown, County Mayo, Ireland on May 19th, 1875. They immigrated to Canada in 1886 with four of their children and homesteaded at Otter Lake near Armstrong, B.C. Rebecca Julia (Winonah) married Harry Barrett in 1894 and died in 1902 [note this is contrary to what is on the tombstone]. Aunt Raby [Rebecca Elinor Robinson] is a sister of Frances Anna Robinson Pelly. It is thought that she was a nanny to the Barrett, the Pelly and McMullen children. There are four graves enclosed by a chain link fence. The plot faces east and overlooks Otter Lake. This tiny graveyard is badly overgrown with rosebushes, Oregon grapes and many other bushes. It is very difficult to get to the grave makers. Until recently the property where the cemetery is located was owned by a descendant of the Pelly family. Pictures are difficult to take and the tombstone of Nona has an engraving that has disappeared. The inscription information is from a survey done several years ago. Go west to Okanagan Street, turn north (right) for one block to Wood Avenue, turn west (left) and enter Otter Lake Road (1.1 km). Turn south-west (left) on Otter Lake Road and proceed for 5.4 km, staying to the left on Otter Lake Road and continue for another kilometre. Go slowly in this last km. 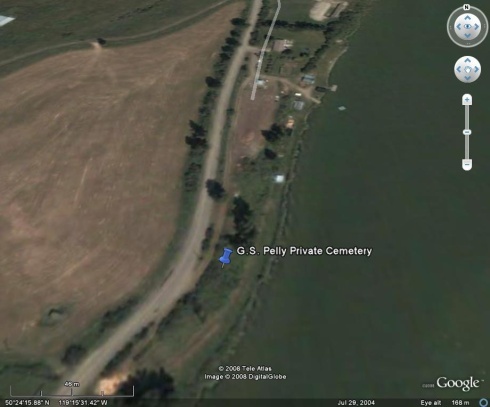 - the Pelly cemetery is on the left - there is a pathway to pull into. 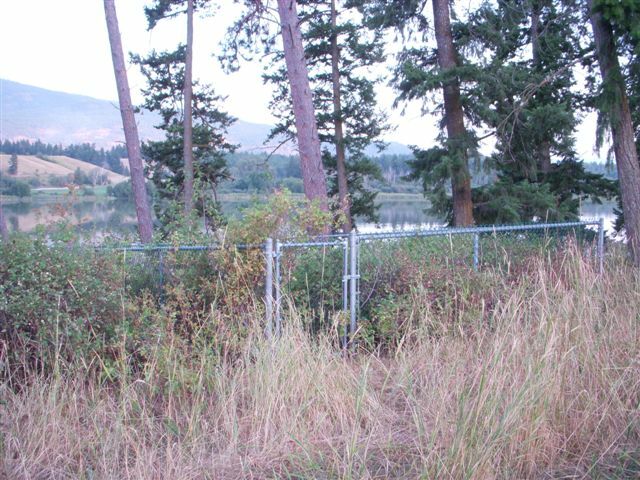 The plot is chain link fenced and has a lot of shrubs in it rose bushes, Oregon grape, and others.